Planet Golf UK has one of the most comprehensive ranges of mens discount golf clubs sets and golf package sets on the Internet. We offer golfers the largest choice at some of the lowest prices, when it comes to golf club package sets we are hard to beat on value for money. 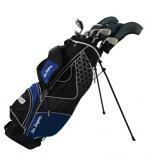 Choose either Left or Right Hand, Cart or Stand Bag, All Graphite, or Graphite/Steel shaft. Browse our extensive selection today from all the top brands!